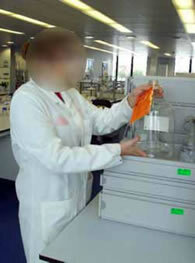 This task was viewed in a laboratory setting. A full 10 litre mobile phase container had to be manually handled from a trolley onto the top of a HPLC machine. This was performed once a day. When full, the container weighed 14kg. The lift from the trolley to the HPLC was a short distance but required the lifter to handle the container with their arms outstretched at or above shoulder height. The container was also difficult to handle as there were no handles and it has a smooth glass surface. It could easily be dropped creating a safety hazard in addition to the musculoskeletal risk. The nature of risk came mainly from a combination of the weight and position of the load. Thus the short-term solutions focussed on reducing the weight of the container and relocating it into a more convenient position. This was achieved by introducing a 5 litre container and to cease using the 10 litre container. This resulted in the weight being halved to 7kg per container; this cost very little to implement. At this altered height and position the HSE guideline loads are 13kg for females and 20kg for males. With the introduction of the 5 litre container weighing 7kg, these guidelines can be adhered to. Female members of staff now feel able to handle the containers much more comfortably. 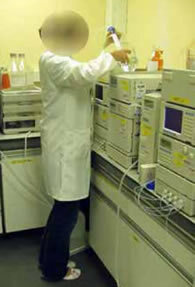 Relocation of the container was affected by re-organising the HPLC machines to allow for adequate space on the worktop. This involved simply removing the top two sections of the machine and placing them by the side, allowing the container to then be placed on top of them. This resulted in the container being handled just above waist height whilst being able to keep the arms closer to the body during handling. This approach has now been adopted generically for HPLC machines within the laboratories. Musculoskeletal injury risk was reduced from high to low. A safety risk (dropping the container) was also reduced. The solution could be implemented immediately. The cost of the solution was negligible. The solution gave productivity benefits, as all staff can now undertake the task. The solution has generic applicability throughout the laboratory area.